Plot: Without giving anything away, the film is the sequel to 1978's monster hit Superman. The film matches the Man of Steel against three enemies from his home planet of Krypton who now possess the same powers as he. Why you should watch it: I debated for months as to whether I should review this film. I believe that most people have seen the original, but may not have seen it as it was truly intended. Some folks don't know that the film was originally directed by Richard Donner, but he left during filming due to conflicts with the producers and the direction they wanted the film to take. If you've seen the cut that was released in 1980, you'll recall it was filled with fluff - Clark reveals his true identity to Lois in a horribly cheesy way, they fall in love, he renounces his birthright, loses his powers, and encounters General Zod, Ursa, and Non. That movie was directed (mostly) by Richard Lester. It was entertaining fluff for kids, but it wasn't the film as it was intended. While I'm not a big fan of meddlesome re-releases (are you reading this, George Lucas? 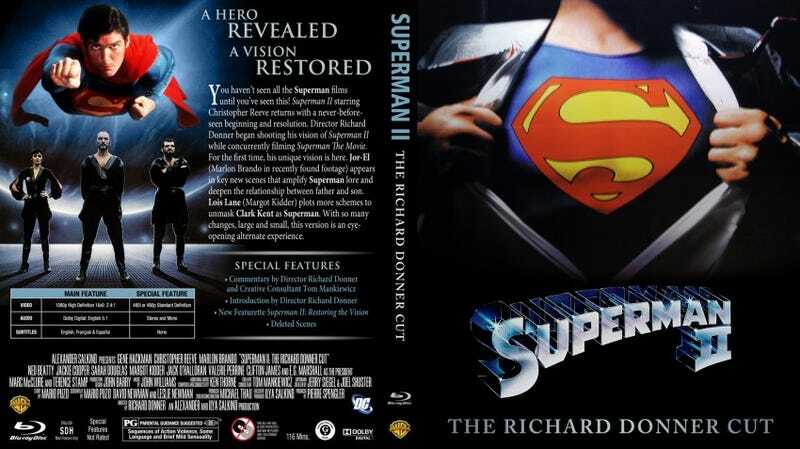 ), I bought Superman II - The Richard Donner Cut upon its release in 2006 because I heard rumblings about the film being much stronger than the original. I was not disappointed. Mind you, some of the footage doesn't really jive - Donner had to cobble together scenes he had shot and place them where appropriate (such as using test-footage, warm-up shots, etc), but I think that only adds to the charm of the movie. The movie isn't a 180 degree turn from the original, however this cut makes it much more accessible to the adult viewer. As a fan of both comics and films, and therefore comic book films, I appreciate when the audience isn't pandered to, and when the source material is actually treated with some respect. I feel that the 1980 release of Superman II as directed by Richard Lester set superhero films back years. When the reboots started popping up, and when they proved to be great films, not just great superhero films (starting with Batman Begins in 2005), people started giving the genre its due. While you may have seen the original, I highly recommend that you give the Richard Donner cut a viewing. Seriously, how long has it been since you heard Terence Stamp command, "Kneel before Zod!"